Costa Concordia Captain Blames Crash On Helmsman : The Two-Way Francesco Schettino, on trial for manslaughter and abandoning his passengers and crew, says the man steering the cruise liner turned the wrong way. 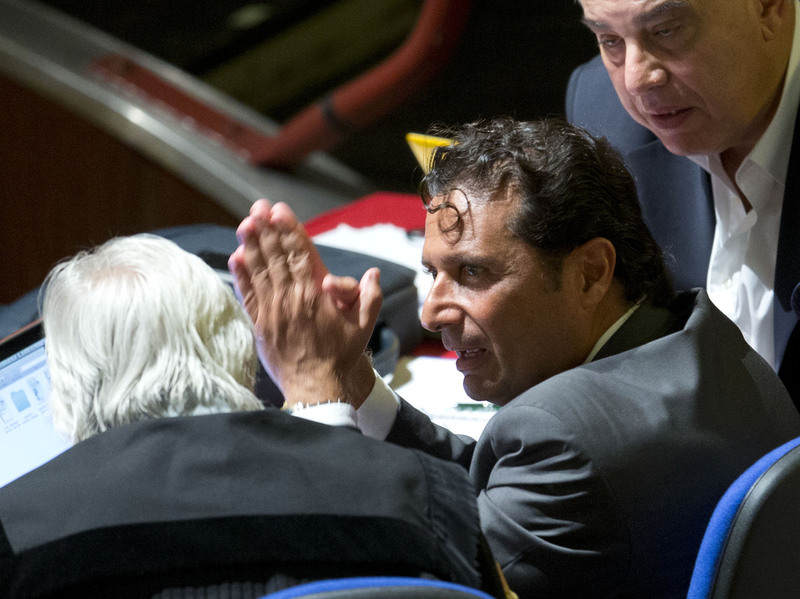 Captain Francesco Schettino talks to his lawyer during a pause his trial, in Grosseto, Italy, on Monday. The captain of the Costa Concordia says the helmsman of the ill-fated cruise liner failed to properly execute a last-minute corrective maneuver that could have kept the massive vessel off a rocky shoal near the coast of Tuscany. Capt. Francesco Schettino, who is charged with manslaughter in the deaths of 32 people aboard the ship, which ran aground on Jan. 13, 2012, is also accused of abandoning the liner's 4,200 passengers and crew on the night of the wreck. The Costa Concordia took on water and capsized after hitting a reef after Schettino ordered a course change to bring the vessel in close to the island of Giglio, allegedly so passengers could get a better view of its brilliant lights. The captain has said that the reef was not marked on his charts. He testified that when he realized the ship's peril, he ordered the helmsman to steer left but that he steered right instead. "Investigators have said language problems between the Italian captain and the Indonesian-born helmsman may have played a role in the botched maneuver. A maritime expert, however, told the court that although the helmsman was slow to react and had indeed erred, in the end it didn't matter." " 'The helmsman was 13 seconds late in executing the maneuver, but the crash would have happened anyway,' Italian naval Adm. Giuseppe Cavo Dragone said Monday." Last week, the Costa Concordia was righted in an extraordinary and unprecedented salvage operation. As NPR's Sylvia Poggioli reported from the scene at the time: "The ship, which is twice the size of the Titanic, will be stabilized and checked to make sure it can make it through the harsh winter. In the spring, the vessel will be floated to a scrap yard."